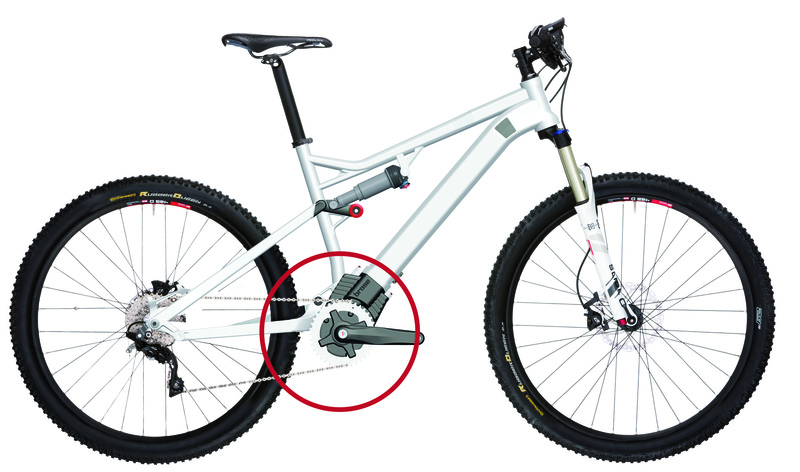 Brose is presenting the first e-bike drive integrated in a full-suspension mountain bike at its IAA 2013 stand. The mechatronics specialist has scheduled the start of series production for May 2014.
International automotive supplier Brose is announcing a new drive solution for pedelecs and S pedelecs at EUROBIKE 2013. The mid-motor produced by the mechatronics specialist differs considerably from the models that are currently available on the market: Unlike conventional drives, it is integrated directly into the bicycle frame. Moreover, it is smaller, lighter and more efficient than comparable products from competitors and its integrated sensors offer smooth pedal assistance. Brose will be presenting a new concept featuring an integrated drive unit and battery pack in a full-suspension bike for the first time at the 2013 International Motor Show (IAA) in Frankfurt. Until now, Brose motors have only been available in cars: the company is the world market leader for electronic braking systems (EBS), drive actuators and cooling fan modules, not to mention a leading supplier of electric power steering motors and HVAC blowers. Now, for the first time, Brose is putting its over 50 years of experience in motor development and global production capacity to use to manufacture e-bikes in response to the steady market trend: around 70,000 electric-powered bicycles were sold in Germany in 2007; in 2011 this figure had already risen to 380,000. The Bicycle Industry Association (ZIV) in Germany predicts sales of close to 600,000 e-bikes in 2018.
on and off smoothly.Brose’s drive is the lightest in its class: weighing in at just 3.4 kilograms, it is 25 percent lighter than current series solutions. This advantage is obtained through the use of lighter, yet higher-strength materials that reduce wall thickness while maintaining stability. An additional factor is the innovative arrangement of components in the smallest possible space, which helps reduce weight further. Brose offers bicycle manufacturers plenty of freedom to create unique designs. The reduced volume offers everything from more variable options for installation to integration in the bicycle frame. Battery design, color selection and even the delay in pedal assistance activation and intensity can all vary depending on the model. Brose is presenting the new drive integrated in a full-suspension pedelec mountain bike at IAA 2013. Series production of the motor is scheduled for May 2014.